Canine parvovirus is one of the most common and severe gastrointestinal diseases of dogs. Parvovirus most frequently attacks puppies younger than one year of age. The virus is extremely contagious and strikes rapidly and without warning. While most infected adult dogs recover, as many as 25 % to 50 % of infected puppies die from the disease if not diagnosed and treated immediately. Your veterinarian can use a SNAP Parvo Antigen Test to detect parvovirus. Early diagnosis is critical to providing immediate and life-saving treatment. What harm is done by Parvovirus? Once the virus enters your pet’s body, it multiplies in the bone marrow, intestinal tract and immune system. As the virus matures and reproduces (over about five days), it can cause life-threatening damage to your pet’s immune system and intestinal tract. Without fast diagnosis and treatment, your pet may die from dehydration and/or bacterial infection. If you see any of the following symptoms in your puppy or dog, contact one of our staff members at Village Veterinary Hospital and we will get you in to see the doctor. The virus can remain infectious on contaminated ground for five months or longer. As a result, your pet can contract parvovirus anywhere dogs come together such as parks, kennels, shelters and pet stores. Village Veterinary Hospital might use additional tests to monitor your pet’s condition. 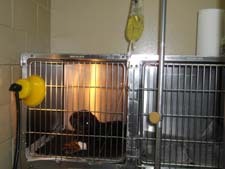 Successful recovery usually takes about three to seven days of intensive veterinary care. Your puppy can be vaccinated against parvovirus. Vaccination begins at six to eight weeks of age, with booster shots every three weeks until your puppy is 16 to 18 weeks old. After that, annual boosters maintain immunity. It is best to avoid taking your puppy to areas with lots of “dog traffic” until he or she completes the vaccination period and has full immunity. 505 869 2627 and follow the instructions.